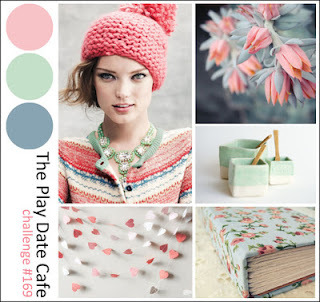 It's time for this week's new color story at The Play Date Cafe. This week our colors are Pink Carnation, Mint and Juniper. I made a card using a new Hero Arts Stamp called Welcome Baby. I thought this paper was very close to the colors and would be perfect for a baby card. I love to look at all your original and creative projects and I hope you will play along with us this week! Our sponsor this week is Simon Says Stamp. Be sure to go to our blog to see their awesome prize!! Such a pretty combo and a great idea to use these colours for a baby card. I've got my right eye on this set of stamps, we have so many similar tastes Donna. What a cute card! I love the plaid background! 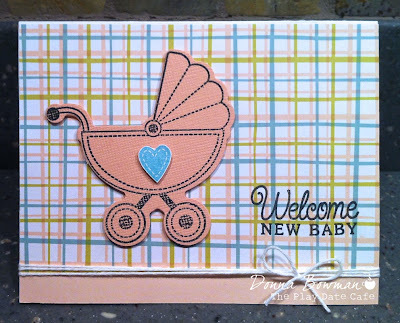 The baby buggy looks great stamped on the pink cardstock! This is a really sweet card, Donna. Working with a staff of primarily women, I have around one baby shower to attend every year. Blessings! perfect baby colors! donna, this is too cute! Donna, LOVE the baby buggy and aren't you the lucky one to have that perfect paper! LOVE how you popped the buggy. This card would be great for a boy or a girl! perfect use of these colors! love that sweet plaid stripe :) that Hero Arts set is awesome!